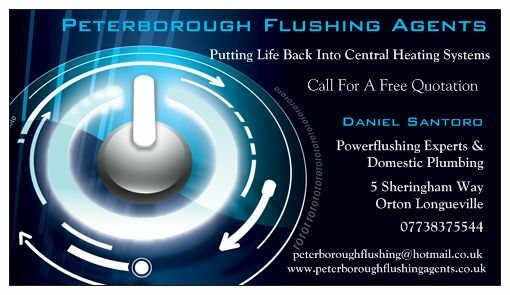 Peterborough Flushing Agents & Plumbing Division aim to satisfy our customers with our intense and very professional central heating flushing services, leaving your central heating system running like new. Once power flushed, your heating system could reduce your fuel bills and ensure increased circulation of heat and hot water around your property saving you a estimated 25% on your gas bills. Our Free Quotation will involve the following........ Before agreeing to power flush your central heating system, We will carry out a thorough inspection and provide written detailing on the condition of your system. We then provide you with a competitive fixed price based upon your system’s suitability and condition.